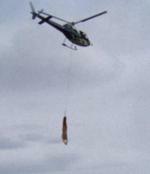 Apparently, there's some controversy surrounding a promotion DDB New Zealand did on January 20 during a musical festival called Big Day Out, at which, according to information we can gather, the agency chartered a helicopter, flew around with a guy hanging off it until, well, he fell off. No one at DDB is talking and we've been informed the employees have been instructed not to speak with anyone about the event. We were forwarded what we were told is a taped phone conversation between, allegedly, someone at DDB and a representative of New Zealand's Civil Aviation Authority during which the CAA representative tells the person at DDB it is illegal not to report an aviation accident which, apparently, DDB failed to do. As is always the case with these stories, details are few and unclear at best. We've sent inquiries to DDB New Zealand for clarification which have gone unanswered. Either something's being covered up or someone's playing a big joke on us. I'm going to place my vote on viral. It has got to be a big joke. Tell that to Vic Morrow. the recording mentions it being in the herald, it wasn't. someone called "jensdagirl" has also been spamming various web forums talking about some stunt/accident NO ONE else actually saw.